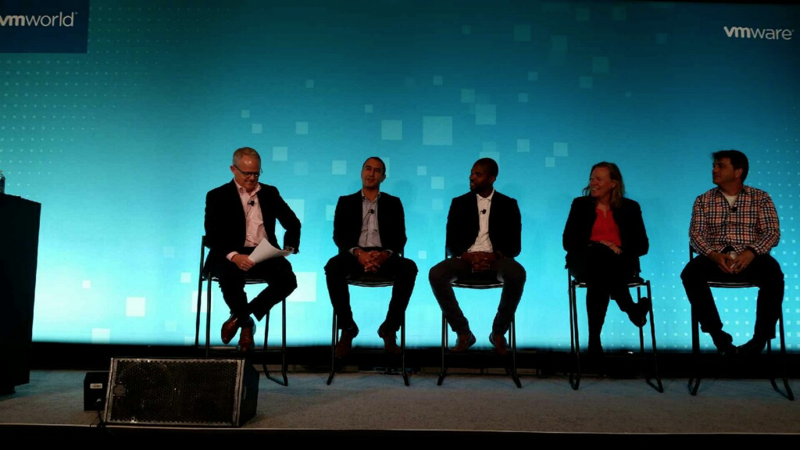 On Thursday, August 30th, JobTrain’s New Initiative Manager, Jennifer Overholt, joined an engaging panel discussion at VMware World Las Vegas 2018, featuring industry experts from all over the world, including the VP of Product from NVIDIA, Senior Director from VMware, Digital Business Manager from National Commercial Bank of Jamaica, and more. The panel approached the concept of innovation as it relates to the enterprise from a higher-level standpoint, as well as how to establish innovation in today’s fiercely competitive world. In order to do this well, we have to build a culture of innovation, as well as get everyone’s buy-in and understanding of the significance of this culture. At JobTrain, we’re doing this by building cross-organizational teams, being transparent about what donors want, and finally, implementing systems like Salesforce Dashboards, so the entire organization has up-to-date information about what is going on. Nonprofits would not be able to build their culture of high impact and innovation without the necessary budget and resources. While partnerships with other non-profit organizations, like GreatNonprofits or the Tipping Point Community, have provided JobTrain with great resources and enabled us to extend our reach to a wide range of people in the community who need our services, the help from individuals in the community is still very much essential. Jennifer closed the panel discussion with a call to action, encouraging to the audience to volunteer their expertise in meaningful, long term ways with their favorite nonprofits.